And as we say down here: A very pleasant good day and tropical greetings to you Northeasterners from warm, sunny and balmy Belize. 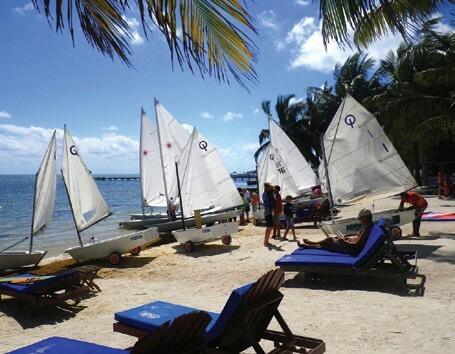 Yes, there is a new Caribbean sailing school, and it is here on the island of Ambergris Caye. 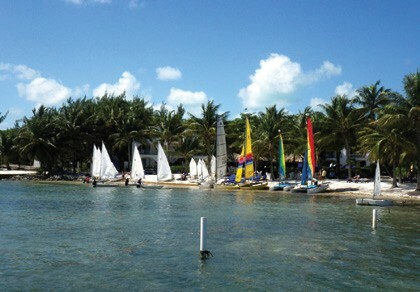 The Belize Sailing School’s (www.belizesailingschool.com) home is the beach it shares with Caribbean Villas Hotel in San Pedro Town, a mere 1/2 mile inside the world’s second longest barrier reef. The sunny weather, steady trade winds, and crystal clear warm waters behind the reef and stilled by it render this venue, in the opinion of those who have experienced it, one of the most idyllic small boat sailing venues in the world, particularly for training. Now, I know that WindCheck’s readers are primarily sailors cruising aboard their own boats and those interested in chartering a boat in Belize, and I will get to that. But many of you started in small boats, and I know many a cruiser who still enjoys taking a small boat out for a spin. True, we have yet to have a caye-hopping private yacht or some wonderful chartered-live aboard catamaran from Belize or elsewhere arrive at our pier and offload sailors eager to sail or train for a day or so in our Optimists, Lasers or Hobie Cats, but we are brand new and fully expect that day to come. This is your invitation. As for cruising in Belize, it is an adventure in paradise. At its best, liveaboard sailing here may uniquely encompass fishing at its best and diving and snorkeling at their best, too. Indeed they are the water sports Belize is best known for. Nevertheless, dotted all along 130 miles of a reef teeming with richly colorful sea life are literally hundreds of tropical cayes (pronounced ‘keys’) to choose from for exploration or a protected anchorage. And for an experience that is definitely unique, yours is most likely to be the only boat there. All but a few of the cayes are completely uninhabited. San Pedro, Ambergris Caye is home to Tortola Marine Management (TMM) Yacht Charters Belize (sailtmm.com/Belize). 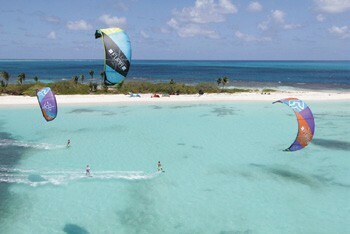 TMM charters catamarans without crews, unless the clients wish to go outside the reef. As manager Simon Beckley points out, “If you are familiar with the Bahamas or the Virgin Islands, Belize will seem vast and untouched. No crowded anchorages, no competing for access to moorings, and no making reservations to hole up in a protected bay.” TMM is renowned for professionalism and especially for the quality of the briefings and charts it provides to bareboat clients. Dead reckoning among the cayes, while easy, is just challenging enough to be interesting. Aside from complete familiarization with the boat chartered, those going it alone will be made completely familiar with the best anchorages behind the cayes on the reef and the best approaches to them. Previous TMM voyagers who have discovered chart omissions – perhaps new or shifted sand bars – will have also triangulated them and measured the new depth. This information will be on your chart, and you may also discover and chart some deviation from what was previously known, and debrief TMM about it upon your return. Then, perhaps a wander down the beach to the Belize Sailing School and spin on a small boat will be in order. The school was inspired by a sailing club’s participation in the First Annual Bart’s Bash International Regatta on September 21, 2014. The event honors the memory of British sailor Andrew “Bart” Simpson, who lost his life in San Francisco Bay while training for the America’s Cup. Prior to Bart’s Bash, common knowledge about Belize was limited to its superior fishing and diving and its wealth of wildlife and Mayan ruins. While some sailors have discovered the country’s several fine charter opportunities, Belize has never been widely known as a sailing destination. Bart’s Bash may have changed all that. The San Pedro Sailing Club (sanpedrosailingclub.com) on Ambergris Caye has been teaching island kids to sail – for free – since 2010. The club entered Bart’s Bash and rounded up 28 local boats of all sizes and skippers of all ages. The majority of the skippers were the San Pedro Sailing Club’s youth members. Most of them sailed Optimists, but a few skippered Hobie Cats. Two or three of the Belizean boats that raced are, well, a bit odd and could not be handicapped, although all the rest finished among the top 15% in the regatta’s worldwide field of 16,780 participants, recognized by the Guinness Book of World Records as the largest sailing regatta in history. The young Belizean Opti skippers all finished in the top 8% in the 1179-boat fleet for that class. The performance of Belize in that historic regatta took the international sailing community by total surprise, and began to establish Belize in the eyes of sailors around the globe as a sailing venue for them to respect, admire and perhaps envy, and to visit and experience. After Bart’s Bash, the San Pedro Sailing Club’s inbox was flooded with emails asking “How’d you do it?” and “What’s it like there, really?” This gave club members confidence that a commercial small boat rental and training venture would succeed as a destination location beckoning to foreign sailors. Hence, the Belize Sailing Center and its Belize Sailing School were born late last year. In January, the San Pedro Sailing Club acquired a fleet of 10 new race-ready XD Laser Radials. The Center hired a charismatic young professional coach from Argentina, who was his country’s National Optimist Champion and had trained Argentinians for success in Youth World Championship Laser racing. He is now the Belize Sailing School’s chief instructor. He leads professional sailing lessons – not just the typical hourly, half-day- or day-long lessons, but 5-day clinics for beginners, intermediate and advanced individuals and groups. The Center partnered with Kite Explorer to bring a professional windsurfing and kiteboard instructor on board, and purchased the necessary equipment, along with some kayaks and paddleboards. Thus staffed and inventoried, the San Pedro Sailing School is now open for business and filling up clinics. Recently, a few families vacationing together enrolled their children in a 5-day Opti clinic. Those kids went home smiling, armed with new tactics to use to advantage in regattas up north. Our typical customers, however, are yacht club Laser sailors who want to gain a competitive edge while their clubs are shut down for winter. Whatever the reason, any time of year in Belize is a good time for sailing. So come on down! Forrest Jones is a 71-year-old retiree whose passion for small boat sailing was ignited in Maine at age 10, only to be thwarted by circumstance. After retiring to Belize a few years ago, he’s fulfilling that dream and enjoying an introduction to cruising in the tropics. “I hate cold water!’ he says.